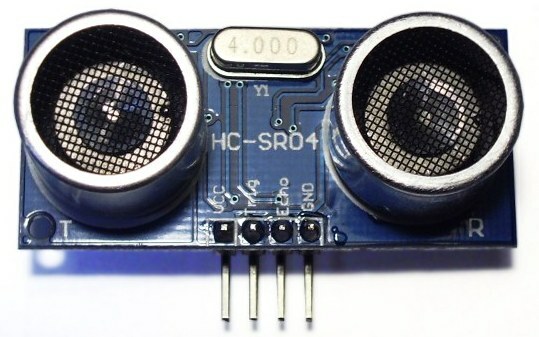 The HC-SR04 (pictured above) is an inexpensive ultrasonic sensor that can sense not only if an object presents itself, like a PIR sensor, but can also sense and relay the distance to that object. There is quite a lot of information on the web regarding this sensor coupled with AVR microcontrollers, but basically they are all done in C with hefty AVRs, like those found on Arduinos. I really wanted to see if I could get this sensor to work on my favorite AVR, the Tiny13, and do it in AVR assembly language. Happily, I've discovered that this sensor can be used quite easily on a Tiny13 in assembly language. And obviously, if it works on a Tiny13, it'll work on other AVR chips just as well. A good starting point is the sensor datasheet from iteadstudio.com. Download it, print it out, and get familiar with page 2 of the document. There you will find a diagram of the pulse timing. What follows is pretty much that same information in somewhat more detail. Make "Trig" (pin 2) on the sensor high for 10µs. This initiates a sensor cycle. 8x40kHz pulses will be sent from the "T" transmitting piezzo transducer of the sensor, after which time the "Echo" pin on the sensor will go from low to high. The 40kHz sound wave will bounce off the nearest object and return to the sensor. When the sensor detects the reflected sound wave, the the Echo pin will go low again. The distance between the sensor and the detected object can be calculated based on the length of time the Echo pin is high. If no object is detected, the Echo pin will stay high for 38ms and then go low. What follows is the mathmatics behind the code of the project. If you are only interested in the nuts and bolts of getting your sensor working then please feel free to jump directly to the hardware and software sections. At first glance there may seem to be a lot of math involved. In fact it's just a few very simple calculations to convert between speed, time, and distance. The speed of sound: 340.29 m/s (meters per second). The speed of sound to an object and back: 170.15 m/s. Time for pulse to travel 1cm to an object and then return to the sensor: 58.772µs. Question 1: A ping takes 150µs to hit an object and return. How far away is the object? Question 2: How long for a ping to hit and return from an object 30cm away? The main piece of hardware used in this project (besides the sensor itself) is an Atmel ATtiny13(A) operating at the default fuse setting, which means it's running at 9.6MHz with a /8 prescaler, which comes out to a 1.2MHz clock on the chip. This is the speed at which instructions on the chip are run. Note that some instructions may require 2 or more clock cycles to complete. See the ATtiny13 Datasheet for details. NOTE: The Tiny13 does not directly accept an external crystal ceramic resonator like other AVRs. Therefore the timings/measurements in this particular project are only accurate to ±10%. An external clock source could be used to drive an input pin, but it would hardly be worth the effort. If you really need more accuracy, I would suggest using an AVR that accepts an external crystal and, if you decide to go that route, the calculations that follow will change depending on the frequency of the crystal used. Question 1: A ping takes 2,110 clock cycles (clks) to hit an object and return. How far away is the object? Question 2: How many clock cycles will it take to sense an object 7cm away? You can see that the clock-cycle to distance conversions won't end up in exact numbers of clock cycles. This isn't a huge issue since the sensor itself is only rated for a resolution of 0.3cm, so the 1.2MHz clock speed is fast enough to achieve that resolution, albeit with a 10% error factor based on the accuracy of the AVR's internal clock. In practice, without a crystal, the best we can do is probably closer to about 5mm~1cm of resolution -- YMMV. Here is all that is needed to run the HC-SR04 on a Tiny13. And here is the schematic (click to enlarge). 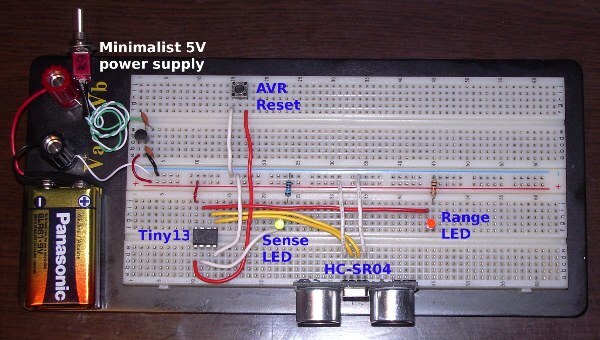 The sensor itself needs 5V to operate, so a simple 5V regulated supply running off of a 9V battery is used. 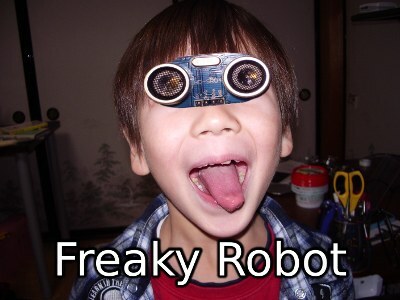 Other than that, you have the sensor itself, the Tiny13, and 2 LEDs and their current limiting resistors. The "Sense LED" (LED1 on the schematic) indicates if an object is detected, and the "Range LED" (LED2) tells us if the object is within the range specified in the program. At this point, it's just a matter of counting clock cycles in the code. The code is heavily documented and includes most of the information on this page. It lists the number of clock cycles per instruction where it matters. There are 2 timing loops, a single-byte loop (BDELAY) and a word-length loop (WDELAY), to burn through clock cycles. Here are links to the above code and the AVR hex file.